The Flash has been around since 1939 and we’ve found some of the best authentic and realistic Flash costumes for men, because at Super Heroes Central we love superheroes especially the classic ones who’ve been around for a long time. We know there are some serious Flash fans out there and we wanted to look after them with real and great looking costumes. The Flash has always been popular, a regular member on Justice League cartoons and featuring in two live action series, one in 1990 and one currently on air which has just been renewed for it’s 4th season, but it’s more tan likely that the Flash is about to get a whole lot bigger with his inclusion in the DC Cinematic Universe’s movie Justice League. 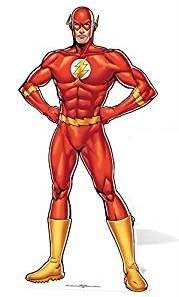 Most people know that he can run really, really, really fast but not a lot people know about his other powers or how he came to get them, if you would like to know more click here for the Flash’s powers and abilities, and find for yourself why he is one the most powerful superheroes in the DC Universe. 2 How Many Different Flashes Are there? Boys love comics and they love Halloween and now more than ever the two are not mutually exclusive with more and more little boys dressing up as their favourite superhero, well guess what? Little boys grow up into Men(eventually), but the fun doesn’t have stop, whether it’s for your own enjoyment or just to spend some quality fun time with your kids there is a great costume out there for everyone and we’ve found some of the best Flash Halloween costume ideas for the adults so even the men(who are in fact just oversized little boys) can enjoy Halloween too. We’ve selected four different styles of costumes based on price point, appearance, functionality and positive reviews(we value what other people have to say, and appreciate them sharing their experiences to help make other people experiences a positive one) so have a look and hopefully there is an authentic Halloween costume that’s just right for you. If you are on this page than you are obviously a big fan of the Flash, but some fans are bigger than others and that’s why we have included this real and authentic looking Flash costume for men. This outfit is for those fans where price is secondary to quality and realism, it intended for men who love to have fun role playing at conventions and comic-cons or really, really want to impress their friends at their next costume party. Made from polyester and leather this product is hand tailored to fit you, included are an incredibly high quality shirt and pants, gloves, boots and mask. This fantastic outfit is styled on the television Flash series and it looks so good it could be prop from the show. It has gotten overwhelmingly positive comments from those who bought it and loved it, some people had problems with sizes, but even this didn’t dampen their satisfaction with the outfit. If you enjoy roleplaying and are looking for a real and authentic Flash costume than this is best one for you. We all love dressing up as our favourite superhero but unfortunately not all the men out there have a body that’s going to look great in a skin tight superhero outfit, but with the best Flash muscle costume for men that we found there there is a solution because this cool costume provides all the extra beef you’ll need to pull off that awesome comic book hero look. Made from polyester this adult sized red full length bodysuit comes with an in-built heroic physique including foam chest, abdominal and arm muscle inserts and sporting the iconic Flash lightning bolt chest insignia and golden stylized belt and attached golden boot tops, as well a cool detached mask. This product has been bought and reviewed by lots of satisfied people with most of them very happy about the quality of the material and great fit, the biggest critique of the outfit was the fact that it is only fastened at the back by a neck tie, leaving a large loose seam on the back, most people remedied this by attaching Velcro on the back for a more secure seal. If you want to be a Flash with muscles to really look heroic than this is the best costume for you. Long before flash was a television and movie star he has been a classic comic book icon for over 70 years, so we have found a this great classic Flash costume for sale. 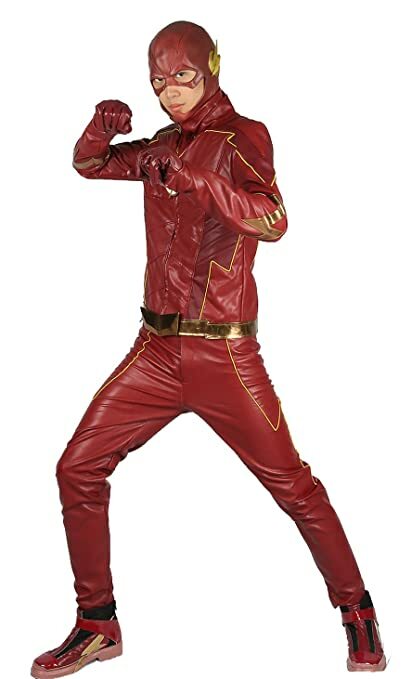 Made from polyester this great red second skin costume for men gives you that awesome look like you just stepped off the pages of the comics of yesteryear, featuring the iconic flash bolt on the chest as well as golden belt and boot tops aswell as a detached mask, it really is an authentic outfit. This costume has received mostly positive comments from those who have bought it, with most people happy with quality and size, but again the biggest complaint was the fastener at the back, with most people again opting to add some more Velcro for a more secure fit, for most people this was a minor inconvenience and it was just a great costume for adult classic Flash fans. 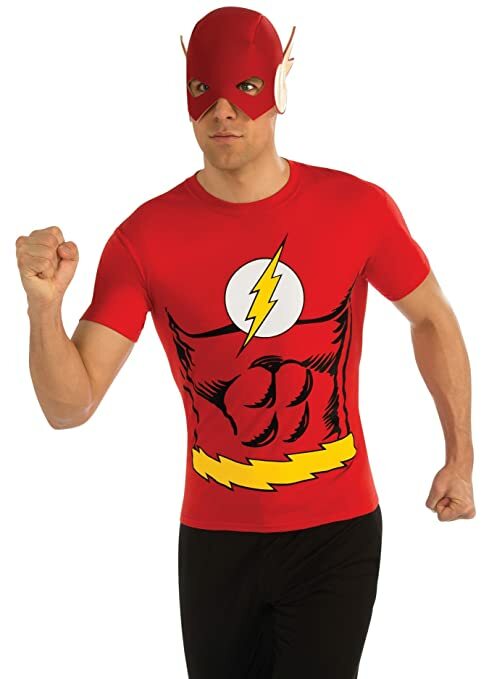 When you want go trick or treating or maybe to a friends costume party but you don’t want to go a lot of trouble or expense, than this cool Flash T-Shirt costume is just the thing for you. It’s quick and easy aswell as very affordable, made from polyester it is a red T-Shirt featuring a print of a very buff set of chest and abdominal muscles and a printed golden belted styled as the Flashes trade mark lightning bolts aswell well as lightning bolt logo on the chest(because he is lightning fast). It also comes with a surprisingly stylish mask to complete the outfit and give you the authentic feel. Reviewed by lots of customers people who mostly loved it, with the biggest complaint being that shirt they received was made from cotton not from polyester as indicated(cotton is a heavier more durable material, which makes it hotter and it also has a tendency to shrink in the wash) but apart people thought it was a great no fuss costume for adults at a great price. How Many Different Flashes Are there? We really love the Flash here at Superheroes Central and we bet you guys do too, but as we were writing this article it crossed our minds just how many different Flashes are there? So we looked around and found this great clip on You tube showing the many different versions, with different secret identities and different costumes, we enjoyed it alot and we hope you do too. Have fun. Only the uninitiated underestimate the powers that the Flash possesses, because those in the know realise that he is one the most powerful heroes in the DC universe(and true fans would have believe that he is the most powerful). Why’s that? Because apart from his signature ability to be able to run really, really, really fast he also can phase shift his body through solid objects, travel through time, is resistant to telepathic intrusion, has increased durability and stamina aswell being surrounded by an inpenetratable barrier and of course he has the ability to hit as hard as Superman using his infinite mass punch. This impressive list of abilities is by no means the full extent of his powers but if you wanted to find out more go to the Flash’s powers and abilities page. Apart from being the fastest man alive and having a cool costume he was a founding member of the Justice League Of America, along with Batman, Superman, Wonder Woman, Aquaman, the Green Lantern and the Martian Manhunter.